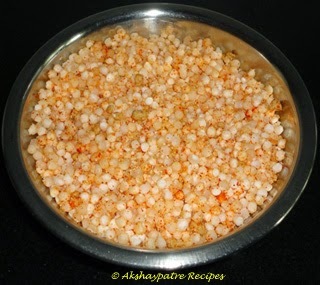 Sabudana batata khichdi recipe - Sabudana or sago and potatoes are widely used in all parts of Maharashtra for preparing upwas or fasting day dishes like sabudana vada, sabudana khichdi and sabudana thalipeeth. Some do not add potatoes in khichdi. But adding potato is beneficial as it is rich in carbohydrates, which in turn gives energy needed on upwas or fasting days. 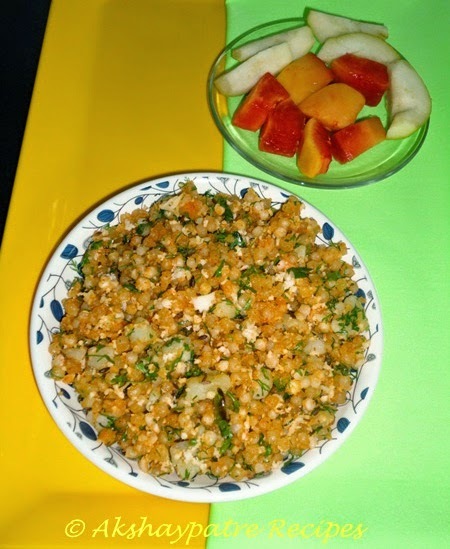 Besides being a fasting dish, it is also a filling breakfast as well. 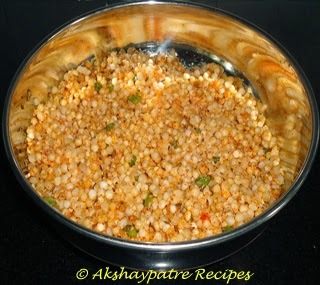 This is an easy yet delicious dish to prepare after soaking the sabudana for two hours. Using red chilli powder is totally optional and it can also be prepared using only green chilies. 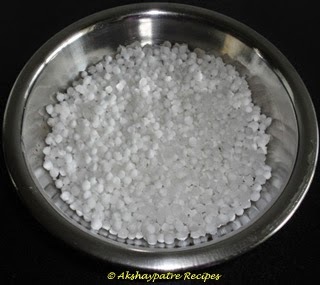 Wash and soak the sabudana in 1/4 cup of water for 2 hours. Boil and peel the potato. Cut it into small cubes. Combine together the soaked sabudana, peanut powder, red chili powder, sugar and salt in a large plate. Mix well till all the ingredients combine well. Heat the ghee in a large pan. Add jeera and green chilli in it. When they crackle nicely, add sabudana mixture and stir continuously. 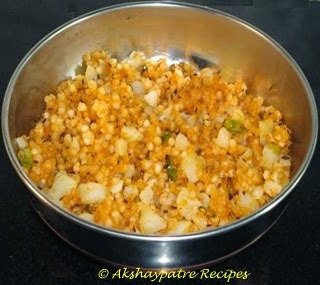 Cook the khichdi on a low flame till sabudana become soft and change its color. Cook covered on low flame till the potato become quite hot. Stir in between. When khichdi is done, remove from the flame. Add grated fresh coconut and chopped coriander to it. Mix gently to combine well. 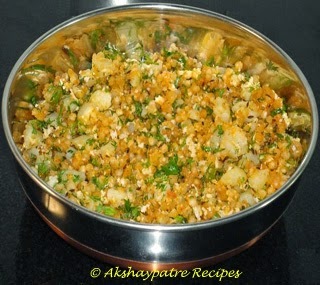 Serve the sabudana batata khichdi hot. 1. Wash and soak the sabudana in 1/4 cup of water for 2 hours. 2. Boil and peel the potato. Cut it into small cubes. 3. 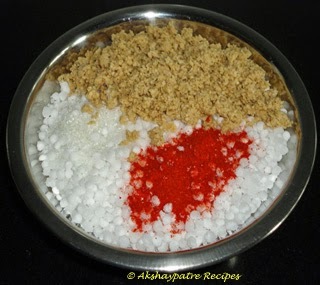 Combine together the soaked sabudana, peanut powder, red chili powder, sugar and salt in a large plate. 4. Mix well till all the ingredients combine well. 5. Heat the ghee in a large pan. Add jeera and green chilli in it. When they crackle nicely, add sabudana mixture and stir continuously. 6. 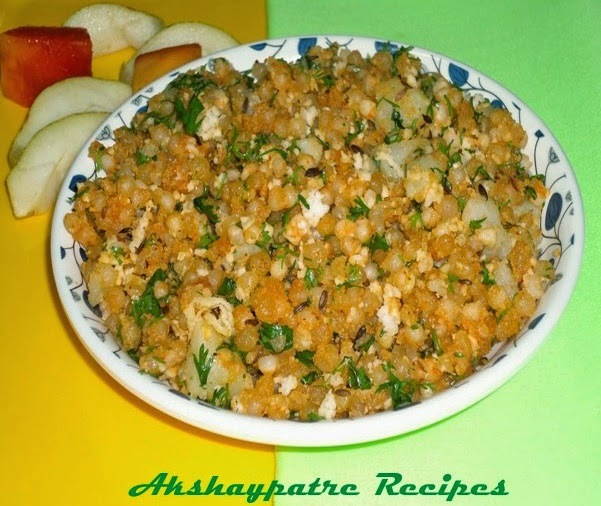 Cook the khichdi on a low flame till sabudana become soft and change its color. 8. Cook covered on low flame till the potato become quite hot. Stir in between. 9. When khichdi is done, remove from the flame. 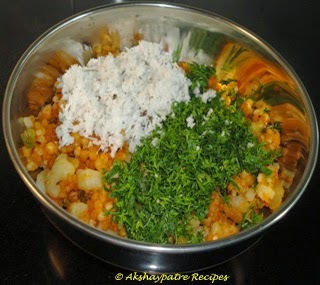 Add grated fresh coconut and chopped coriander to it. 10. Mix gently to combine well. 11. 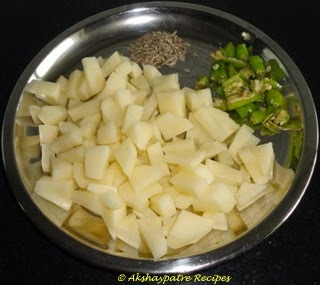 Serve the sabudana batata khichdi hot. Feel like to finish those two plates. Truly delicious...loved step wise pictures with neat instuction. Looks yummilious..more tasty with potato...We too use potatoes in khichdi. this si somehting soo new to me and felling really curious to have a spoon ful of it right now. Vidya, hey ! i have got something for you . hop over to my space. 3 things, u get...2 awards and...a hug !!! ;) Have a great day ahead ! this sounds very healthy n luks so yumy..